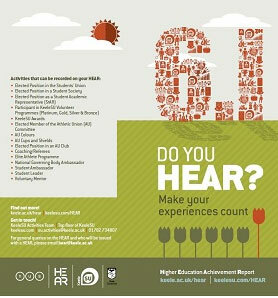 "The Higher Education Achievement Report (HEAR) will be issued to Keele undergraduates graduating from July 2014 onwards. It will provide a single record of academic and other achievements during your time at University, including a section outlining any HEAR recordable activities you take part in. These activities will help to define you as a graduate to employers and go into ‘Section 6.1’. It’s completely up to you what activities you take part in. This diagram illustrates your HEAR journey."